This may seem basic, but no matter your winter sport of choice, staying warm is important. Choosing the right clothing and equipment will help you and your kids stay toasty throughout the activity. Dress kids in warm, water-resistant layers with a hat, scarf and gloves or mittens. Children lose body heat faster than adults, so make sure they take indoor breaks every 30 to 40 minutes. When playing in cold, dry air, it's easy to forget to stay hydrated. Even if you're not sweating, you are still risking dehydration. Encourage kids to drink plenty of water before, during and after play. Children are at increased risk of dehydration compared to adults, even in cold temperatures. Though it might seem odd in winter, don't forget to put on sunscreen when skiing, sledding, skating or snowboarding. Sunlight reflects off the bright white snow and ice and back onto your face--so cover up with sunscreen, and put some lip balm that contains sunscreen on your lips (even when it's cloudy outside). 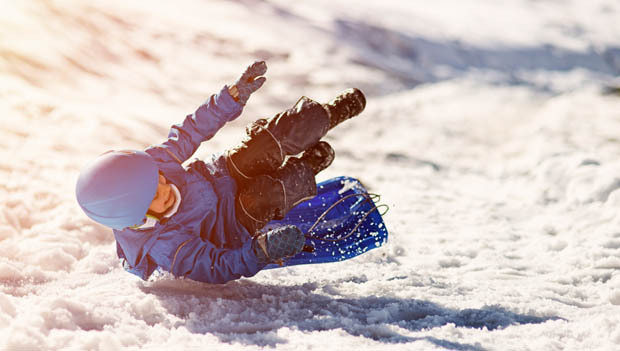 Whether headed to the local sledding hill or frozen lake for skating, follow these winter sports safety tips to ensure maximum fun for the whole family. Make sure the sled is sturdy and has handholds that are easy to grab. Only sled on hills that do NOT end anywhere near cars or a road. Sled only in daylight or well-lit areas. Never attach a sled to a snowmobile, car or any other object. Slopes and kid power are the only things that should increase the speed of sleds. Only skate on approved ice. Ice that looks and seems strong may not be able to hold a child's weight. Never skate alone when skating on a lake or a pond. Always skate in control and with the flow of traffic on the rink. Wear the right size skis or board that fits you. If it's too big, you won't be able to keep in control. Take lessons if it's your first time. Always ski or board in control. Angela Bekkala is an ACSM Certified Clinical Exercise Physiologist and RRCA Running Coach. With a background in exercise science and over 15 years of experience in the industry, she is well versed in movement. She is the author behind the popular healthy living blog, Happy Fit Mama, that focuses on running, yoga, fitness and sharing nutritious recipes for the whole family.